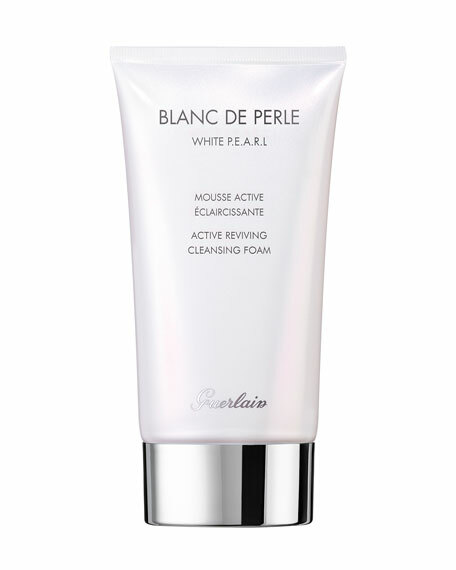 Guerlain Blanc de Perle Active Reviving Cleansing Foam, 5.1 oz. GuerlainBlanc de Perle Active Reviving Cleansing Foam, 5.1 oz. Made up of delicate and biodegradable micro-pearls for a gentle exfoliation, when applied, it refreshes and brightens the skin to reveal a glow with pure, fresh radiance. Apply to the face morning and evening by mixing a drop with water to form a lather, then massage delicately onto the skin. Rinse thoroughly. 153 mL / 5.1 fl. oz. For in-store inquiries, use sku #1726369.